​"And my God shall supply all your need according to His riches in glory by Christ Jesus" (Phil. 4:19). "And God is able to make all grace abound toward you, that you, always having all sufficiency in all things, may have an abundance for every good work" (2 Cor. 9:8). "I have been young, and now am old; Yet I have not seen the righteous forsaken, Nor his descendants begging bread" (Psalm 37:25). "Oh, fear the Lord, you His saints! There is no want to those who fear Him. The young lions lack and suffer hunger; But those who seek the Lord shall not lack any good thing" (Psalm 34:9-10). "And you shall remember the Lord your God, for it is He who gives you power to get wealth..." (Deut. 8:18). 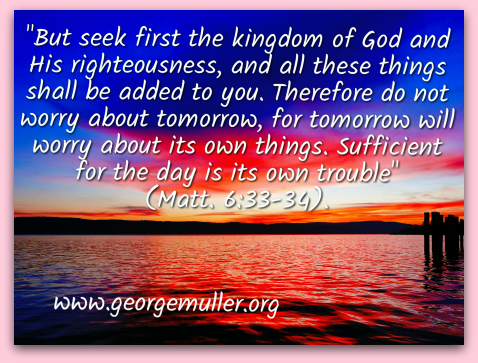 "But seek ye first the kingdom of God, and his righteousness; and all these things shall be added unto you" (Matt. 6:33).